The contamination of Patalganga drove Capt Joseph Lobo, who sailed for 16 years, to work for its solutions. Capt Lobo got involved with the environment and good governance issues. Formed AGNI (Action for Good Governance and Networking in India) in Mumbai, along with others and is Trustee of this NGO. He shifted to Goa in 2008 and settled at his ancestral village in Colvale and started working on sewage treatment and disposal system (STADS). “STADS is now a Make in Goa system of handling and dispersal of sewage in an environment-friendly way as it recycles the sewage for the benefit of the people without any residue, sludge or side-effects. 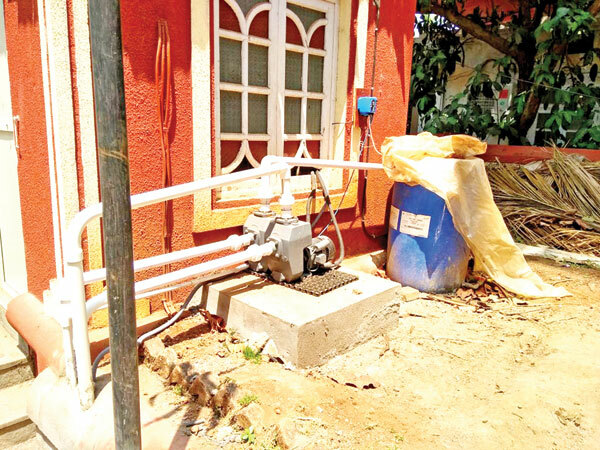 This system was patented in 2016 and is in operation in Goa and elsewhere since 2010 and is approved by the Goa Pollution Control Board,” said Capt Lobo. As charity begins from home, Capt Lobo got his first project installed in his own home which is next to a water body and rocks and there was no space for soak pits. It was subsequently passed by the health authorities. “This encouraged me and then there was no turning back. I wanted to make it big and contribute to the society by offering my technology. Today we have completed at least 68 projects in the State. Future plans are to create mechanisms for rehabilitating rivers. The trials have already been carried out in St Inez Creek for one year and the blue print is ready. It just needs a chance for implementation,” added Capt Lobo. Water is one of the biggest resource and in Goa, despite having nearly five rivers there is always a water shortage. On an average, in Panjim alone, 310 liters of water per day per person is consumed as against the national average of 135 liters. Sixty per cent of water used by the urban population goes down the drain to flush one kilogram of human waste. STAD is designed to treat this valuable resource in a bio-reactor or collection tank without usage of any chemicals. By recycling this water which has been used to flush the human waste every four hours in a day, around 32000 cubic meters of water is saved and this is being done by the use of effective micro-organisms (EMs). The same water is being used to maintain garden and the systems grid helps distribute water directly to plants and trees. The company Sustainable Designed Solutions which is running this STAD system has installed its project in 68 locations in the State in the last eight years. This includes places like resorts, hotels and even residential complexes. This STADS model is also working on ‘Internet of Things’ (IoT) to make it more convenient for the servicing of the storage tanks and periodically recycling of waste water.